Blurb: Running the gamut from trance to dub to breakbeat, The Megadrives release an appealing sophomore album that takes their diverse style even further. As technology moves forward into an age where convenience and speed are seemingly essential, the abundance of laptop DJs and artists to emerge has been staggering. As the state of the art calls for a greater reliance on software, it should come as no surprise to see a group like The Megadrives taking full advantage of the trend. Based in Baltimore, MD, the duo of K-Rai and Sheephead have for the past several years been building up their reputation as a dynamic force, playing numerous festivals and events covering the spectrum of electronica from techno, electro, breakbeat, and all points in between, and releasing their Press Start debut in 2008. 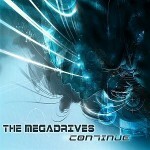 After three years, the Megadrives unveil their sophomore record, appropriately titled Continue. From the opening breaks and throbbing synths of “Unite,” the group kicks into high gear right from the get go; wave upon wave of electrified bass and sparse melodies intertwine to create a highly energetic opener that immediately calls to mind the likes of The Chemical Brothers and The Crystal Method. Such is the case with every track on Continue, with the throbbing pulse of “Neon Tokyo Night” launching us into a danceable frenzy as each sequence builds upon itself to create an infectiously appealing track. Similarly, “Ears of Pain” assaults the listener with a distorted, almost guitar-life wave of arpeggios and thrums of atmospheric bass, while the stabs of ambient synths and distant manipulated vocal samples help to give “Enlighten” a trancelike vibe, making it easy to get lost in a psychedelic haze. Other tracks slow the pace without diminishing the album’s progressive energy, from the slower tempos of oscillating ambience and gritty bass lines of “Welcome to My Side” evoking a neon-lit urban soundscape, to the shimmering acoustic guitar accompanying warbling bass and relaxed and occasional glitchy beats of “Crunk Dub,” to the more hip-hop style groove of “Of What Magnitude” as whistling synths underscore rolling arpeggio melodies too catchy to not get stuck in one’s head for hours. “Idealism” is perhaps the eeriest track on Continue as its crystalline ambience hovers in tandem with glitch-laden samples and beats that could serve as soundtrack to a dark acid trip, while “Moose Tail” ends the record with a pastiche of the chiptune trend with rapid fire arpeggios of rudimentary synth tones akin to 8-bit video games before breaking down into a hard-hitting finale of pulsating techno.